Kudos to the hiker for being willing to share her story in such detail. It is interesting how a few relatively minor problems combined to lead to a truly life threatening situation. A navigation misstep led to being in steep terrain where she slipped. Sprained ankle leading to reduced mobility. Wet clothes and lost gloves increasing the risk of hypothermia. She is clearly a very fit and determined person, who was experienced and reasonably well equipped, but her efforts at self rescue ultimately put her in a really precarious position. Different people may draw different conclusions from this...my observation is that the situation would likely have been much less dangerous if she hadn't been hiking alone. And obviously, for someone hiking alone in winter, ALL of the ten essentials are truly essential. Wow, that is a crazy story. It looks like she started the hike this past Sunday and was rescued on Monday. This is generally true - if one person is injured the other could go for help - but if both are lost it's not necessarily a better situation, and it sounds like in this case large navigational problems led to this rescue. So I'm not sure a 2nd person would have helped in this situation, unless that person had additional equipment or better navigational skills. As she notes at the end of her interview, she should have brought a paper map and compass. Relying on only your phone is risky, especially in winter where batteries die quickly in the cold. A paper map could have gotten wet and illegible though. But I would say that along with always having a headlamp (this is one of those lessons you learn the hard way by having to walk out of somewhere in the dark), one should always have a physical compass. Even without a map, a compass can at least point you in a direction, and if you know generally where you are, this is better than nothing. So on my way back down I decided to check out Warren Lake. Navigating out of there proved to be very difficult with all the snow and debris on the trail. Even with using Gaia, I undershot Starvation Ridge and found myself separated from the trail by a ravine. I crossed it hoping to reconnect with the trail on the other side but had no luck. So I decided to backtrack and due to the slick terrain I fell into the ravine (Warren Creek) twice, falling further down each time. If she was trying to find Starvation Ridge (top elevation 2800 ft), that means she had already been to Warren Lake (3700 ft), and was heading E/ENE. That terrain is not too tricky, even in snow, and I cannot (even while looking at a map) figure out where she would be "separated from the trail by a ravine." (From my recollection there is no place like this in that area.) 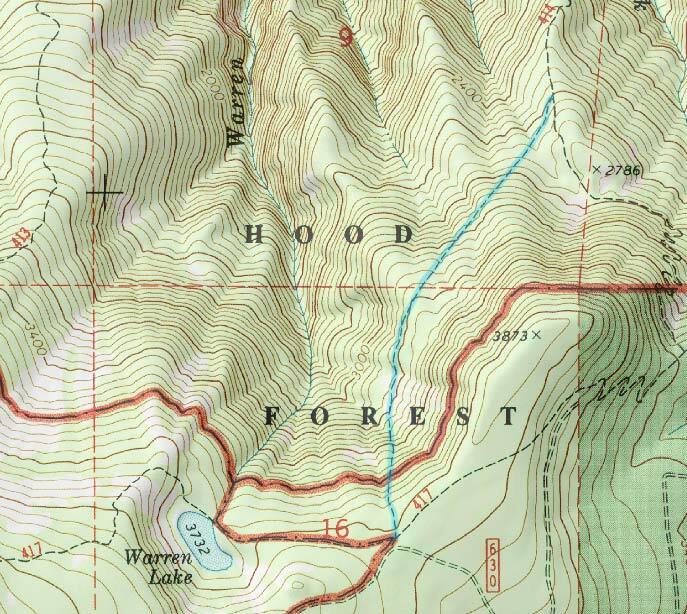 She then fell into this ravine, which she refers to as Warren Creek, which is due north of the lake, not east of it where the Starvation trail is. So unless she was trying to follow the fake Warren > Starvation trail that shows up on maps, I'm not sure how she got herself into Warren Creek to the point where she would be able to follow it downstream until she got stranded at Lancaster Falls. Let's hope this is not actually an example of the fake Warren>Starvation trail claiming a victim. I don't know what Gaia shows, but it still should have been clear that there is a trail going around the S/E side of pt 3873. Everyone does make mistakes, and this is one of the most justified cases of rescue I've encountered in the Gorge (ie, it wasn't because she just did something really foolish and avoidable), but it's still a good reminder for people about how much harder navigation is in the winter, especially if you're used to following trails blindly in dry conditions and not self-navigating. Always carry a map and compass! I'm glad that she appears to have come out unscathed, and good on the Crag Rats for pulling her out of Lancaster Falls - that sounds very dicey! So I'm not sure a 2nd person would have helped in this situation, unless that person had additional equipment or better navigational skills. My speculation (and it is only speculation) that a companion would have helped was based on the simple assumption that two people are unlikely to both sprain their ankles at the same time. If one person falls and is injured, the second one will presumably recognize that the situation has become really problematic and render assistance. And two people may be more likely to make good decisions about how to extricate themselves from a dicey situation. In this case, it seems like the injured hiker came closest to death when she fell near Lancaster Falls. If a companion had been able to stay with her and assist in keeping her warm after she sprained her ankle, even if both of them were lost, they might have avoided that journey down the mountain that almost ended disastrously. But happily there was a good outcome anyway. Let's hope this is not actually an example of the fake Warren>Starvation trail claiming a victim. I don't know what Gaia shows, but it still should have been clear that there is a trail going around the S/E side of pt 3873. Can you identify the fake trail? Is it the northern route around pt 3873 that departs the Starvation Ridge 414 trail just north of pt 2786 and continues to Warren Lake? That stretch of trail appears on all the maps I have, marked as trail 417A. My memory of the Starvation Ridge route up is there is only one trail to Warren Lake and it's trail 414. Can you identify the fake trail? Is it the northern route around pt 3873 that departs the Starvation Ridge 414 trail just north of pt 2786 and continues to Warren Lake? That's the one; I've highlighted it in blue here. It doesn't exist in reality. Most Gaia maps will show OSM trails which should be pretty darn accurate but even the USGS one is close enough other than that one trail. Maybe we should cut that trail one day so no one ever gets lost on it. but even the USGS one is close enough other than that one trail. It's true: in the Defiance area, the official maps are at least good enough to keep you from getting lost. For reference, I've attached a map of reality (in blue) overlaid on the USGS map. It doesn't exist in reality. And, importantly, it never has. Various people have gone looking for it in summer conditions and haven't found a trace. I personally crossed straight through where it would be while coming up from Cabin Creek Ridge and there is zero trail bench in that area. That stretch of trail appears on all the maps I have, marked as trail 417A. I wonder if it was a planned spur trail that was never built but somehow got included on official maps? That would be a hell of a mistake. Regardless, without further clarification from her it's not really clear exactly what happened. It does sound like she somehow left that plateau east of Warren Lake heading to the NW rather than SE side of pt 3783, but it's hard to imagine why you would head downhill to the north (in the Warren Creek area) if you had any familiarity with the terrain and/or a map at your disposal. The only way I can figure that happening is her blindly following a line using GPS, but that would only be possible if she had zero prior experience up there (ie, did not realize that trail doesn't exist, or is not the normal way you'd go), and from what I gather that fake trail doesn't even show up in Gaia anyway. Very perplexing, but it's phenomenal that she somehow didn't get hypothermia after falling in the creek in the snow. It's really fantastic that she came out of this unharmed. It's been a while since I've done the route, and always did it the other direction. But after the long climb, you hang a right (vaguely west) and after a half mile or so, drop a short distance to Warren Lake. So she would have needed to head up a bit than flat for a while to get to the descent. Knowing that there is a long descent, it would be fairly normal to undershoot that traverse and start down too early, or maybe just not go up enough. Then heading across too low, there would be that ravine. I think a big question is when navigating without a trail and you determine you are not on the route you want, how long to you keep going through more difficult terrain and when do you decide to turn back, since you know that route, and maybe in snow there will even be tracks. Although the trail itself would not have been visible, she was figuring that the terrain would be reasonable. She doesn't mention that she had her spikes on, but maybe that is what she needed of she was slipping in steep terrain. Last edited by drm on February 10th, 2019, 9:40 am, edited 1 time in total. It also sounded like because she didn't have a paper map and her phone was malfunctioning, she had to remember the map from memory. It could very well be that her memory of the terrain was wrong and contributed to her problems. She is very lucky she survived I think.